Magic Kingdom was designed so that when you walk under the train bridge into the park, it’s like a curtain opening – the start of the show. 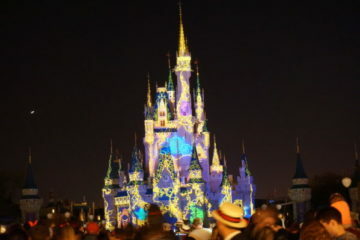 What’s really magical about it is that it appeals to all of your senses! Today, we’re going to talk about your sense of smell! After you walk under the bridge, give yourself a minute to catch your breath, then take a big whiff! 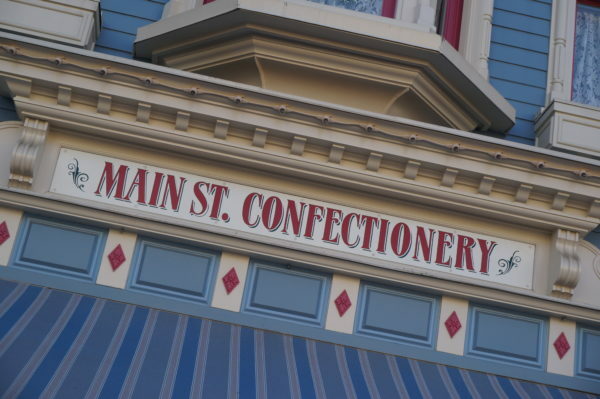 Chances are you’ll smell the sweet deliciousness of the Main Street Confectionery. You can smell the Confectionery before you even see it, and it’s kind of an inconspicuous, turn-of-the-century style building. After you smell it, you’ll want to find the source. The Main Street Confectionery feels like a nostalgic, old-fashioned, candy shop! The Main Street Confectionery is an old-fashioned candy shop in Disney World’s original park, Magic Kingdom. Cast Members make all of these sweet treats not only on site but many are made right in front of your eyes! Let’s take a look at some of the sweet treats you can find inside the Main Street Confectionery! The Main Street Confectionery is famous for their candied, caramel, and chocolate-covered apples. Their classic design is a Mickey apple. It’s dipped in caramel and then milk chocolate, rolled in red sprinkles for the pants, and topped with two jelly beans for the pants buttons and two chocolate covered marshmallows for the ears. 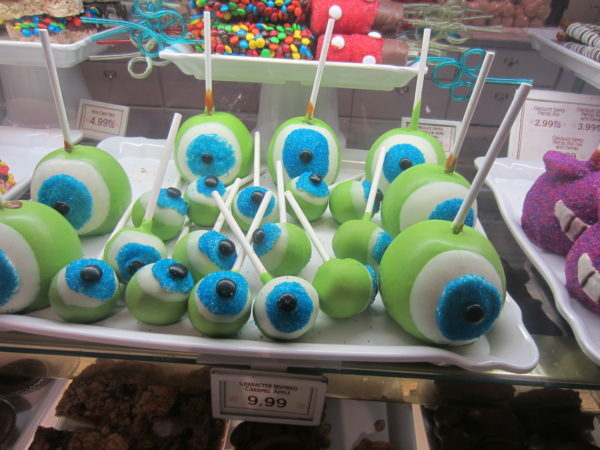 The apples also come in other Disney character designs like this one themed for Mike from Monsters Inc. These apples are delicious, but they’re pretty expensive (around $10). 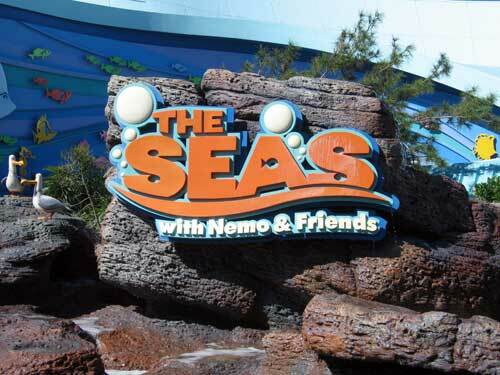 They’re plenty enough to share, though, so just ask a Cast Member to slice it for you! 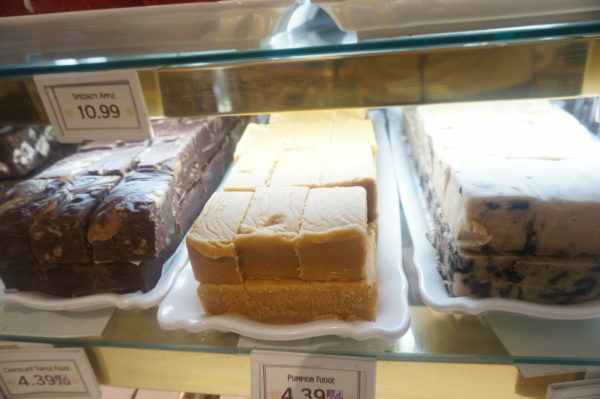 The Main Street Confectionery also makes mouth-watering fudge. It’s so smooth and tasty! This is often one of the things that you can watch being. Main Street Confectionery makes a variety of fudge flavors including peanut butter, chocolate, cookies and cream, and even seasonal flavors. 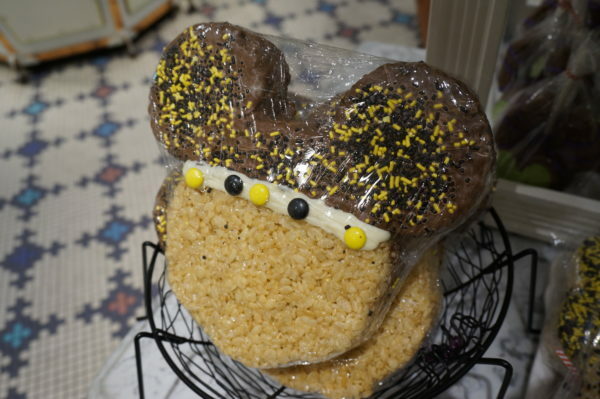 The Main Street Confectionery also has a variety of rice krispie treats and cookies. 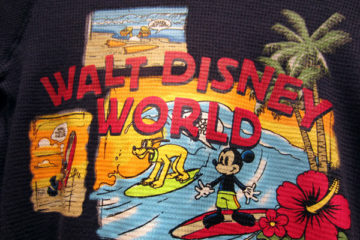 Some of them are Mickey-shaped, and others feature different Disney themes. 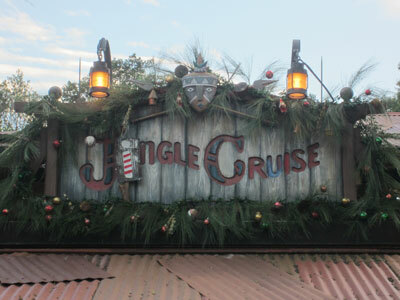 Some of them are even seasonally themed. 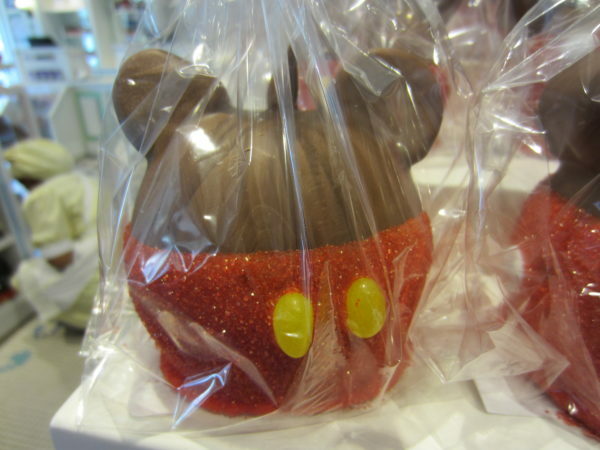 Here’s a rice krispie Mickey Mouse cookie dipped in chocolate and sprinkles. 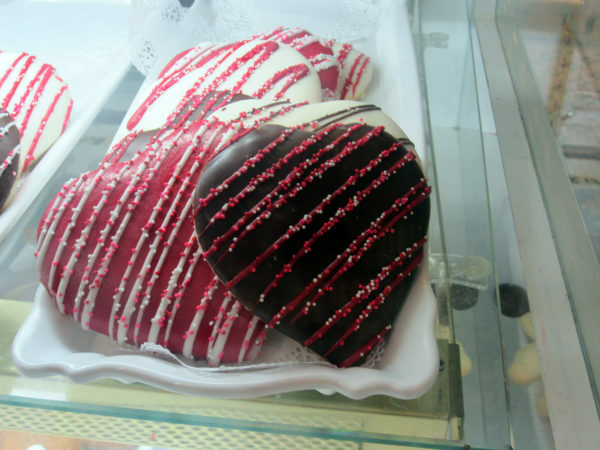 These heart cookies come out around Valentine’s Day! 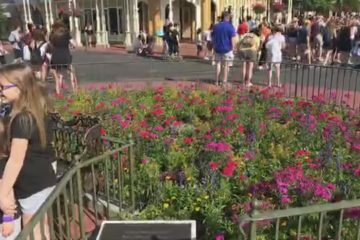 There’s nothing like celebrating your love of each other in Magic Kingdom! The Main Street Confectionery has so much to offer that I couldn’t even show everything here! You’ll also find even more cookies, brownies, gourmet candies, cotton candy, bagged candies, and peanut brittle. Stop in and take a look around even if you don’t plan to buy anything (which you probably will anyways). 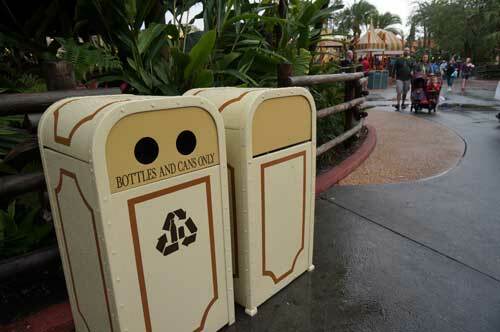 This is usually the last place I stop on my way out of Magic Kingdom. What’s really great about Main Street Confectionery is that most of their treats are large enough to share, and they only cost one snack credit on the Disney Dining Plan! What’s your favorite snack in Main Street Confectionery?